The Body Shop originally launched it's first Body Butter in the early 90's and we were in love with it back then.It continues to this day to thrive as a best seller and sells at a rate of one every three seconds! 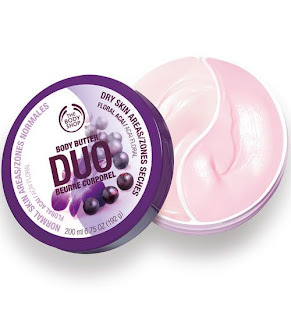 Now they create a duo body butter. One that provides two sections in the container.One side featuring a feel great moisturizer for the main body areas, and another side for areas that need more moisture, such as our elbows and knees- you know, those rougher spots. Great scents include the floral acai body butter, vanilla, macadamia and sweet pea. I have always been a big fan of body butter - how about you?